President Nelson has made a big push about using the name of our church, but it wasn’t always known as the Church of Jesus Christ of Latter-day Saints. Michael Marquardt, an unsung hero in Mormon history, tells why the church changed names a few times. Michael: In May of 1834 members of the United Firm, which was like an auxiliary of the church at that time, met and changed the name of the revealed name of a Church of Christ to the Church of Latter Day Saints. And that’s where that name comes in. GT: Now, I just interviewed–in fact we just published it yesterday it was–an interview with Steve Shields and he said that it was Sidney Rigdon who came up with that name Church of the Latter Day Saints. Michael: Yes. He proposed that. Sidney Rigdon was an elder and also high priest in the church. And the church is in deep debt at that early time of 1834. And that was one of the reasons at that time that they, said that the church was organized in Fayette–to protect the organization. It’s the same reason as the next year in the 1835 First edition of the doctrine and covenants, they used pseudonyms. No there was not real names but other names. So people would not know who the revelation that we’re referring to to protect the organization, protect the individuals. GT: For financial reasons is that the main reason? Michael: From what I can gather that that’s the main main reason at that time. GT: Okay. Okay. So let’s recap here. So April 6, 1830 the Church is organized in Manchester. In 1833 it’s published that it’s still organized in Manchester. In 1835 we start having some difficulties with finances. So they renamed the Church: Church of Latter-day Saints. They left out Jesus Christ, by the way, I’ll add in. Michael: Well, it was 1834. Yeah. You’ll notice sometimes while the name, Jesus is not there or the title Christ, it was also used at that time. 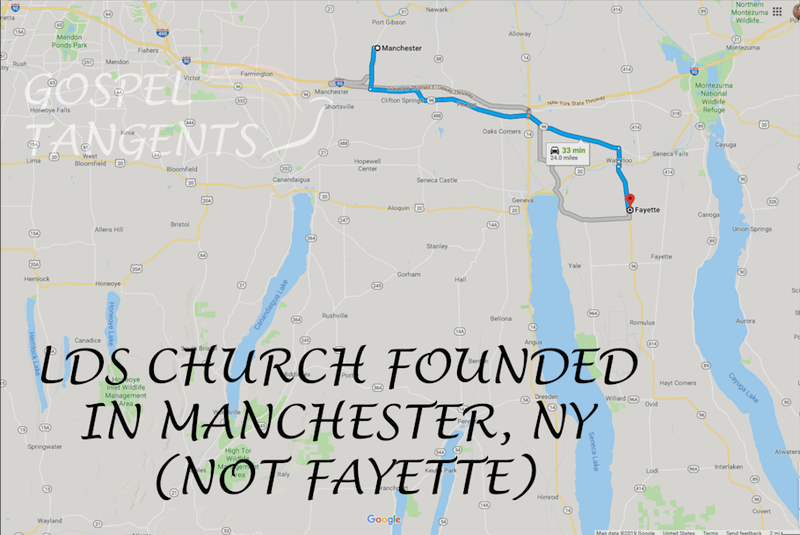 You probably noticed that Michael said the was founded in Manchester, New York, contrary to the official church history record that the church was organized 30 miles away in Fayette. How does Michael make his case, and why is there a discrepancy? GT: Why does the church say Fayette and why are you saying it’s in Manchester? Michael: Well, it’s basically trying to look at over a period of time, where the baptisms occur, where the revelations were given. And, of course the early Church of Christ did publish in the Evening and Morning Star, the first church periodical that it was organized and established in Manchester on April 6. And that’s also where you find where it mentions six members. So there’s probably was six individuals. We don’t know if they’re a male or a female. GT: Okay. You said this was published where again? Michael: In the ‘Evening and the Morning Star’ in Independence, Jackson County, Missouri. GT: And what was the date on that? Michael: It would be March, 1833 and April, 1833. GT: So in March and April of 1833. The Evening and Morning Star is saying that the church was organized in Manchester, not in Fayette. Marquardt says several revelations occurred in Manchester in April 6, 1830, and this was because it was the first church meeting. Were you aware of a discrepancy in the historical record for the location of the founding of the Church? Michael Marquardt says the Church was organized in Manchester, some 30 miles from Fayette, NY. Does he make a solid case? Previous post: Who Bears Responsibility for MMM?